Here's video of our descent on the Balcony of Auris, a narrow road that is carved into the steep cliff high above the Romanche Valley floor by Bourg d'Oisans. It's hard to tell but it's about 1,500 feet straight down from this very narrow road! According to DangerousRoads.org: "It’s a road in France to die for (or die on, if you're not careful!). This cliff road is asphalted and goes through the Combe de la Fayolle. Is it normal for your palms to sweat looking at those photos, imagine what it must have been like before the barriers." 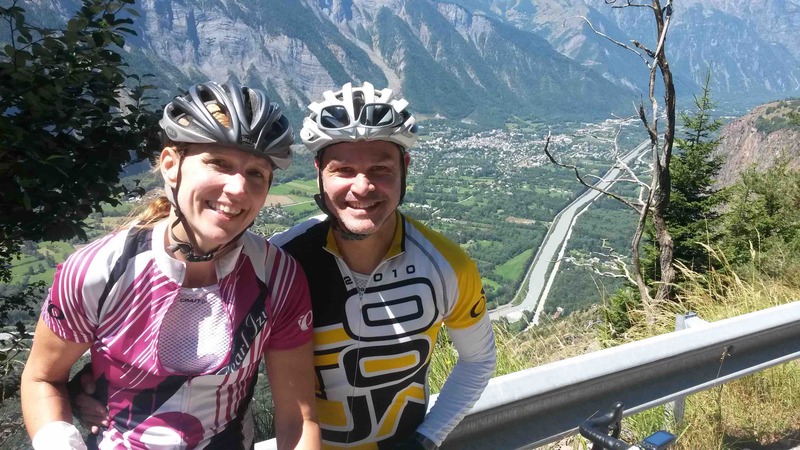 Here's a photo of Val and me with Bourg d'Oisans in the distance.